Peony gardeners had an entirely new group of peonies to choose from with the introduction of Itoh peonies to this country in 1969, expanding the color palette and plant forms available. First developed in Japan by Tiochi Itoh, this form of peony, also known as intersectionals, has grown to more than 100 varieties, thanks in large part to American hybridizers like Roger Anderson. Intersectionals are a cross between the common herbaceous peony and the woody-stemmed tree or shrub peony. The result is a peony with some of the best attributes from both parents. They are easier to propagate and more cold hardy than tree peonies, while showing a greater range of color—especially in yellows—than herbaceous peonies. The first of these peonies were so rare and sought after that root divisions were being sold for $1,000 or more. Gardeners still pay a premium for these plants, but many are available now for $100 or less. 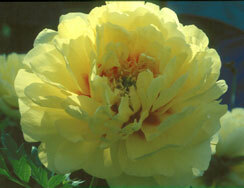 Some of the most popular intersectional peonies are yellows, such as Garden Treasure or Bartzella, pinks like First Arrival, red like Unique and white like White Emperor. Intersections now available come in a wide varieties of color and plant form and are among the most beautiful, easy to care for peonies a gardener can buy.